The weekend is winding down to an end. 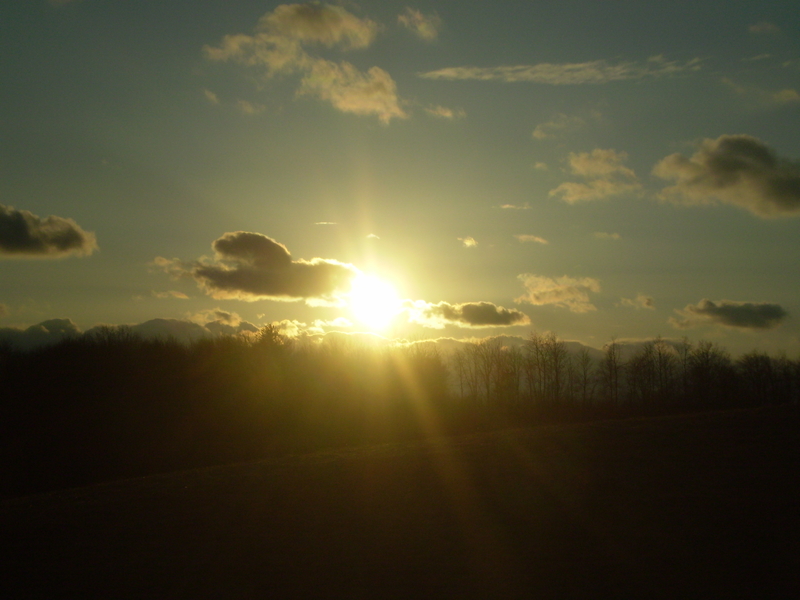 Out my window, I can see the golden clouds of Sunday’s sunset. Still beautiful, touched by the magic in this world that all too often we forget exists. It’s so easy to run about busy when we should stop every once and a while to look at the sky, trace leaves as they sit on the trees, and to pet the friendly dog that it pattering by. These last few hours I have been breathing softly and still, living and relishing in this beautiful world and being grateful for the moments in my life that allow my to kick my shoes off and lean back and try to guess what shapes the clouds are taking. What a wonderful weekend! It was really nice to have the house to ourselves. Nowhere to go, nowhere to be… nobody demanding our attention (except a kitten, who was mostly a pleasure to play with anyway). We were able to curl up, talk about whatever we wanted, do whatever we wanted. Bryan made a scrumptious steak that was marinated for a week (yes, I know, it sounds like overkill, but if you had tasted it, you wouldn’t think so) and we started watching this really awful movie called “Vegas in Space”. We got about five minutes in to this ridiculous, B-rated, 1980s (at the latest) sci-fi murder mystery before it stopped being funny and started being painful. It was still a lot of fun, though. And it’s nice to be able to escape and burrow away with someone who loves you even when you look like Medusa when you wake up in the morning. The clouds in the eastern sky are bright pink now, and the neighbors on the lake are starting to shoot off fireworks. I think it’s time for me to bury my head into my writing and lose the rest of my weekend to comfort. If only every weekend could be so simple and welcoming. With the movie of Eclipse fresh out of the oven, the time again comes when any level-headed, perfectly rational, life-treasuring human being pulls the covers over their eyes and hides from the rabid fans. Or perhaps I’m a bit unfair. You see, there are three kinds of Twilight fans. Type One: Rabid, insane people who stalk Robert Pattinson and ask him to bite their children. These are the ones that call themselves “Twi-hard”. Type Two: Those who argue for hours and hours over who’s better: Jacob or Edward. They will occasionally stop talking to their friends over the issue, but only for a few days, and not forever (for those who hate those of the opposite team forever and always, see “Type One”.) Type Three: Those who read the books, appreciate them, go to the midnight premieres most of the time, and keep up with the news. Certain types are, naturally, a little easier to abide by. For me, I know only Twos and Threes. I get to read about Ones in the newspaper and online, though. What makes these young adult book series’ such a phenomenon? Is it just because they are what they are: book series’ for young adults whose hormones aren’t stable and therefore it’s not about the books- it’s about the hotness-scale of the characters? Is it because the writing is the most brilliant thing this side of Mars? Or is it all about telling a good story? I think it’s a mixture of all three (of course, many Twilight fans will tell you it’s all about Edward). I am biased: I picked up Twilight once when I was a senior in high school and didn’t like the writing style, so I put it back down. There are a lot of people who have done the same as me, but there are also those who can (and will) argue that Stephanie Meyer’s writing style is easy to read and superior to any other they know. Hey, awesome. I’m glad that it works for y’all. I choose not to talk about my opinions of the characters, or Meyer’s plot (which seems entirely dependent on Bella procrastinating on picking either Edward or Jacob). I’m not suicidal, see, so I will leave the story itself alone. From what I have heard, however, the screenplay is fantastically close to the actual books (the Harry Potter directors could stand to learn something) and that is a nice relief to the fans. However, the film cast and crew probably doesn’t want to be killed by rabid fans by being incompetent. Is it worth our time and effort to throw ourselves into these fictional worlds? I’m not just talking about the world of Twilight– goodness knows I’ve been waiting for my letter to Hogwarts for ten years, and there are many out there that would die for a chance to see Hobbiton or have tried to build their own lightsaber. The real question isn’t whether it’s worth our time and effort, the real question is: why do we do it? No series outside of fantasy has as big of a following, as many obsessive fans. Fantasy has always been escapism. It is true that young adults seem to pick it up more whole-heartedly (and no wonder- adults obsessing over fictional characters are judged much more heavily than teenagers), but there are people who come home after work and sink into an armchair with that tattered copy of Prisoner of Azkaban that they just finished last night, and they open it up to page one again… “Harry Potter was a highly unusual boy in many ways…” It certainly isn’t just the “geek” community who dives into the fandom. It’s amazing that as everyone is wishing they could fly a tie-fighter instead of punching in data, we are escaping into our fantasy worlds and binding ourselves together as a community. Oh yes. I said it. Twi-hards, you are equal to those wanna-be Jedi. Pott-heads, you are equal to those who do not simply walk into Mordor. So even though I do not like Twilight personally, I respect Stephanie Meyer just as much as I respect J.K. Rowling. They are both gods, in their own right- weaving worlds of wonder for all of us to enjoy. Whether it is Narnia, or Middle Earth, Tatooine, Forks, Hogwarts, Discworld, the Calla… I can go on. We all exist in them in our imaginations to escape our world. Fanfiction is the inner reaches of our souls trying to control those worlds we love. Roleplaying gives us a chance to live in those worlds, even if only for a moment. I dressed up as Obi-Wan Kenobi for Halloween when I was a senior in high school. I own a time turner. I have every single Harry Potter book, including Fantastic Beasts and Where to Find Them, Quiddich Through the Ages, and Tales of Beedle the Bard. I own half of the New Jedi Order series. I have read Attack of the Clones by R.A. Salvatore 5 times. I own the special extended versions of Harry Potter and the Sorcerer’s Stone and Harry Potter and the Chamber of Secrets. 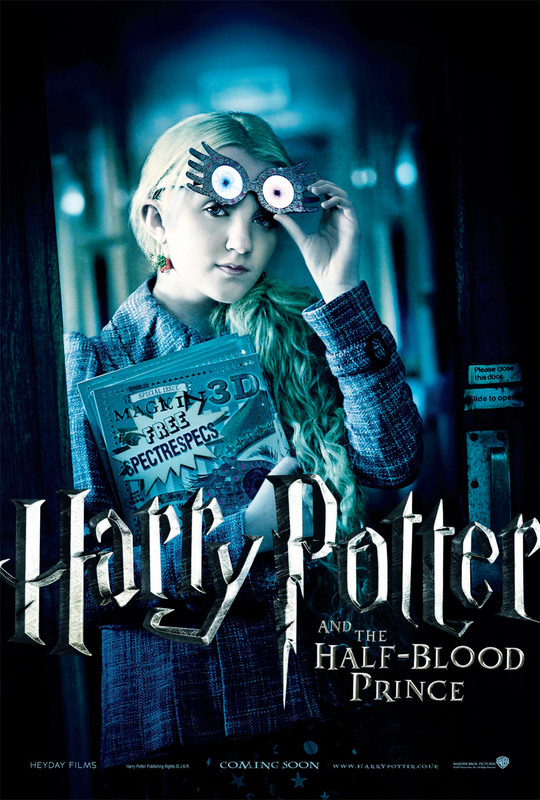 I am dressing up as Luna Lovegood (see image above) this Halloween. I have read the Harry Potter series all the way through twice, and I have read Harry Potter and the Prisoner of Azkaban at least 10 times (I stopped counting). I have music from A Very Potter Musical on my Zen. I own the Lord of the Rings trivia game… and rock at it. I learned proper English grammar by writing Harry Potter fanfiction. I online-roleplayed in the Potterverse for two years (until there were no more decent forums). I once spent a whole week pouring through my Harry Potter books to prove that Draco and Hermione were a more feasible couple than Draco and Harry, even though I don’t ship Draco/Hermione. I own soundtracks to Lord of the Rings: Return of the King, Harry Potter and the Prisoner of Azkaban, and a collectors edition of Harry Potter and the Sorcerer’s Stone. I’ve taken the online Harry Potter Sorting Tests enough to know that I don’t fit in one house, I’m split between two (Ravenclaw and Slytherin) but if I was actually at Hogwarts, I’d be sorted into Ravenclaw. I own the videogames: Knights of the Old Republic, Harry Potter and the Goblet of Fire, The Force Unleashed, Lord of the Rings: The Two Towers, Lord of the Rings: Return of the King, Harry Potter and the Chamber of Secrets. I dominate at Harry Potter Scene It. I go to every single Harry Potter premiere I can get to. I went to 2am showings of Attack of the Clones and Revenge of the Sith. I spend the entire time watching the Harry Potter movies pointing out all the discrepancies from the books. 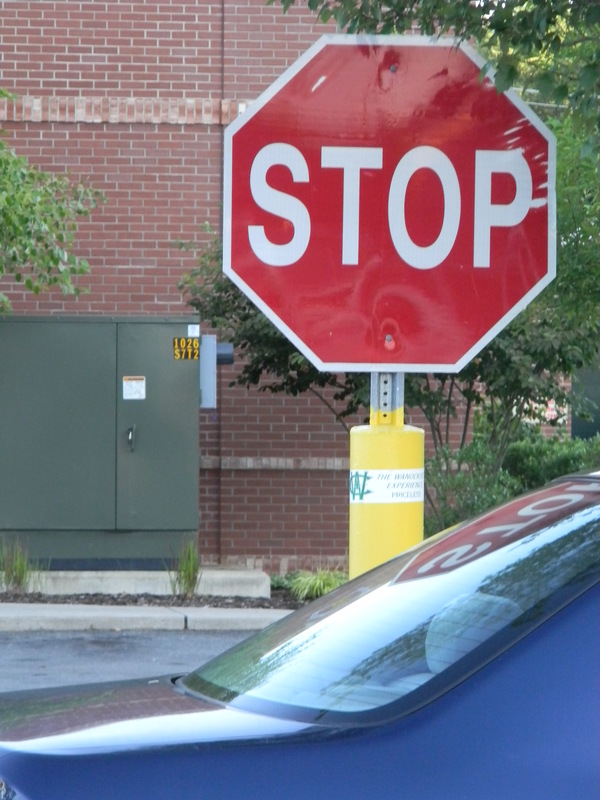 Somehow, this amuses my friends. That is all I can think of at the moment. What about y’all – do you have a list of “guilty secrets” that ties you to your favourite fictional worlds? A cardboard cut-out of Edward Cullen, perhaps? Arwen’s pendant? How many times have you walked into your closet, hoping you’d come out in Narnia? I’d love to know about it! Sheep Get Friday Mornings Off… AT PIGFARTS! I absolutely, positively cannot sleep. I have been sitting here on my bed since about quarter past midnight, and it is now quarter to two. In the morning. My phone alarm is going to go off in three hours, and I’ve not had a wink of sleep yet. I’ve even stooped so low as to contemplate counting sheep, but I’m pretty sure they’d be at the cafe and unavailable for counting, or some other silliness. Since I came to the conclusion that sleep wasn’t coming (at least not yet) I have sat at my computer and haphazardly photoshopped a background for this blog. For anyone interested in the least, all you can really see is a neck, shoulders, and a necktie. The necktie is of the Hogwarts variety and is in mixed colours of blue and green. This represents my username: slytherclawchica. When Harry Potter first came out, there were a slew of “what house are you in?” Quizilla quizzes. I took many of them, and when combined and averaged, they told me I shot be cut in half and split into two different houses: Slytherin and Ravenclaw. Slytherin is for the devious and determined (unfortunately, these often end up to be evil. But not always) and Ravenclaw is for those who seek knowledge. It makes me a dangerously driven person, always seeking greater understanding and not afraid to impose my view on the world. I love Harry Potter. Not the character, the series. I think I’m going to sit here and be happy about my geekiness for a moment. You know, I had the greatest conversation for about two-and-a-half minutes today about the Harry Potter world. It made me happy. Then it ended, because we jumped topics. I could seriously talk about Harry Potter (the series, not the character) forever. For. Ev. Er. You can time me. But I’m not going to. I think I should go to bed, really, and count sheep. Even if I have to row myself to Le Cafe du Soliel in Paris (I made that up) to find them. Then I’ll buy them croissants. And it will be marvellous. I think I may talk about Harry Potter tomorrow. Egats, so many options. Although technically when I say tomorrow, I mean today, but I refuse to acknowledge that today is actually tomorrow until I’ve had a wink of sleeo between the two. Oh yeah. And the “pigfarts” thing in the title is a reference to “A Very Potter Musical”. I am feeling much too silly to go look it up right now so I can post the links, but if you dare consider yourself a Potter fan, you will scurry off immediately and YouTube it. Oh yes. YouTube is a verb now. 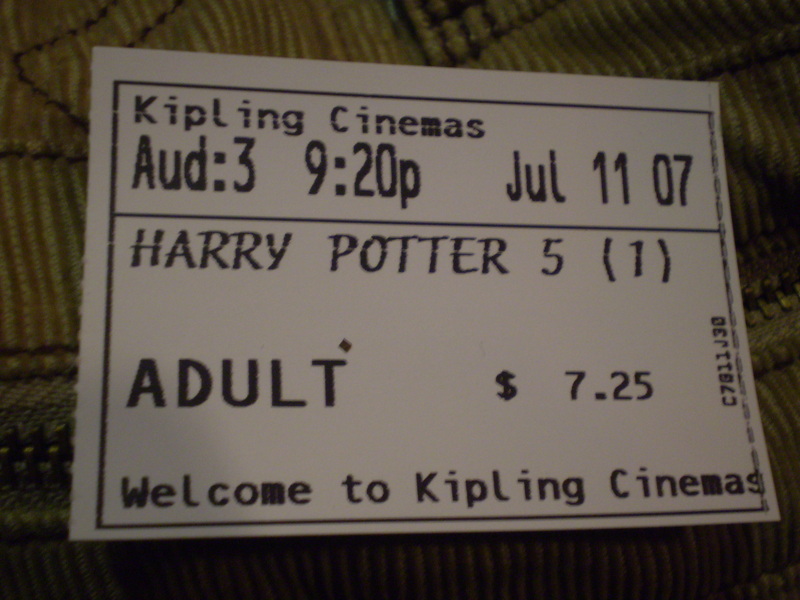 The picture of my Order of the Phoenix Ticket makes me happy. Caitlyn and I searched for a “premiere” of the movie, because we had gone to almost all of the others together. So we found a midnight somewhere, and we went there and got in line at 9pm. For a midnight movie. It was awesome. Not as awesome as the midnight premiere of Philosopher’s Stone, or the Attack of the Clones or Revenge of the Sith 2am premieres, but it was still cool. Iamsuchageek. I should go to bed now. Goodnight, world! Wherever you are, I hope the skies are filled with stars and your dreams are sweet. “Look, I’ll do the flying. All you have to do is hold on. Look at me. 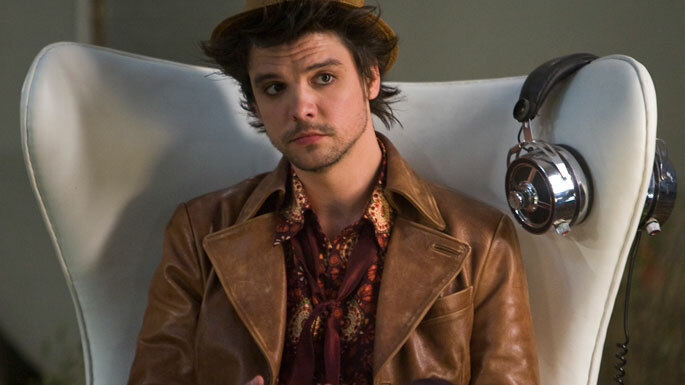 I wouldn’t let you do this if I didn’t think you’d be okay.” ~ Andrew-Lee Potts as the Hatter in Alice. So I had time to kill this afternoon before my internship, which naturally means that I wandered into the DVD section at Wal-Mart and happened upon something I probably shouldn’t have purchased, but did anyway. It’s pretty much what I do when I’m bored and have at least $5 in my bank account that is unaccounted for. Yes, I know it’s a bad habit. But I may as well stock up now while I have the chance, eh? I’m a little silly in the fact that I will never buy movies I’ve never seen, because I don’t want to get stuck with an investment that falls apart. But I spotted upon the Syfy mini-series Alice for $15, and I had heard from people who have similar tastes to mine that it was good. So, since it was considerably inexpensive for a mini-series, I picked it up. So glad I did. The first thing I thought of when I started it was that the style and the colors were very much like Tin Man and The Tenth Kingdom. Now, of course, I understand why- Tin Man was also a Syfy channel mini-series (hey, what do you want, I don’t have cable television). Having become a fan of the Alice in Wonderland franchise in the last few years (yes, before the Carter-Depp-Burton extravaganza, which, by the way, I enjoyed), I was curious and plopped down on my couch immediately to watch it. At first, I wasn’t incredibly impressed. Having a brunette Alice was a twist already (she is always, always, always blonde. … Always) and now she’s also a black belt in karate? Um. Yeah. Well, non-traditional, at any rate. I don’t want to insert any spoilers, for those interested in seeing it, but haven’t yet. But it definitely picked up from there. And I was about to be incredibly disappointed in the ending, but, I wasn’t. I was in the middle of texting Bryan “So, Alice was pretty good, but the ending was kind of a let down” when it twisted around again from the traditional take that endings like that have. Again, I don’t want to give away spoilers, so I’ll say no more. I was pleasantly surprised. It’s the sap in me. 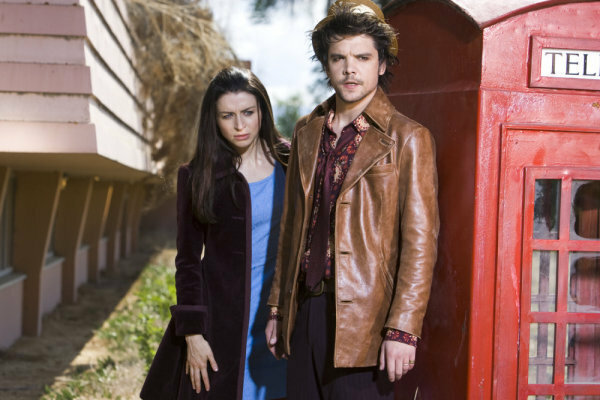 Currently, I’m not sure I liked the mini-series because it was well-done, or because I got to ogle at Andrew-Lee Potts. I have never even heard of this actor before, but the second he came on screen, I fell in love with him. He was a main character, but didn’t get top billing because he’s not that famous (yet). Tim Curry is famous, he got top billing, he was in the thing for fifteen seconds. Bah humbug to all that. Anyways. Andrew-Lee Potts. He played the Hatter, and again, not sure if I’m biased because I think my heart melted into a puddle in my chest, but he seemed to do a pretty good job acting. Scratch that. They all did a pretty good job. And I really liked the King of Hearts. A lot. Such a different take on the character. There was a line, after the Queen of Hearts ordered “off with his head” and walked out of the room, he said “bring him back. By tomorrow she’ll have forgotten she killed him.” Which was funny, but also served a lot to say about both characters. Brilliant, brilliant, brilliant. It was definitely a great new twist on a fairytale that is becoming as old as time. Worth seeing for any fan of the Alice in Wonderland franchise, and for any proper fantasy fan. If you like things like Tin Man, or even Firefly, Alice is right up your alley. In other news, I don’t know how frequent future posts are going to be because I am temporarily moving in with someone with significantly comfier beds and a shower with a better hot water heater than mine. I will be living the good life, oh yes. Be jealous.